Murphy beds fold down from the wall, making them ideal for small and multi-use spaces. When closed, they look like a bookcase, cabinet or wood panels. When folded down for use, a standard-size bed appears. The bed can fold down from the wall in the standard – vertical – way, or along one side in the “horizontal” fashion. Since a standard mattress can be used in a Murphy bed, they are more comfortable than fold-out sofa beds – no support bar running along your spine! And, they can be stored fully made up with sheets and blankets- so, you don’t have to rush to make up your guest bed before your guest arrives. 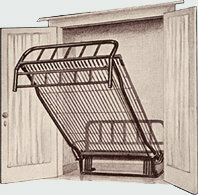 Murphy beds were invented around the turn of the last century by (yes, you guessed it) Mr. Murphy. 🙂 William L. Murphy invented the bed as a way to compensate for a lack of space in his one-room apartment, and the rest is history. They were popular for several decades, then as more folks purchased larger homes, their popularity declined. Today, they are popular once again as more rooms do double-duty in today’s homes. Murphy originally designed his beds to be hidden behind closet doors, but today’s versions often offer more of a “free-standing” look. There are many companies making Murphy beds today, including many local cabinetmakers (click on the photos in this article to visit the websites of two companies that make Murphy beds – they are even listed on Amazon!). The fold-down mechanisms are available online and elsewhere for DIY projects . Sometimes, side cabinets or shelves are added to enhance the function of the bed and to provide some storage when the bed is closed; often, you would hardly know there was a bed there unless someone told you! 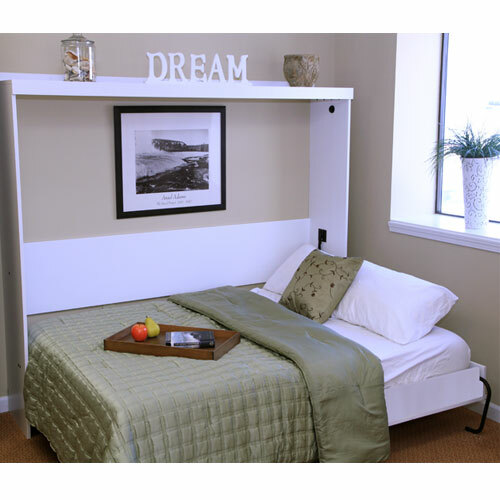 Consider using a Murphy bed in places where space is at a premium and in room you typically use for another purpose. Adding a Murphy bed to a home office, an open loft space, a studio apartment, a family room, or even a child’s bedroom brings a second purpose to the space and adds another sleeping space to the home. They can also be extremely useful in cabins or vacation homes where extra sleeping space is often required for guests. 3 Responses to What Is a Murphy Bed? If you’re interested in a 21st Century version of the Murphy Bed, check out Zoom-Room, the electronic, remote controlled, retractable Murphy Bed. Just press the wireless remote, and it floats into the room. You can also put a flat screen TV in front! Check it out at www. Zoom-Room.com. Fantastic post Teri! I am looking to purchase a murphy bed in order to allow our office to act as a guest room when needed. I had no idea that there was a horizontal option. I’m so glad it was helpful! I have a client looking at the horizontal option right now, too; it means the difference between getting a sofa into the office/guest room and having to do without. The standard Murphy Beds just stick into the room too far.